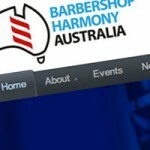 Barbershop Harmony Australia - 2012-06-25 - News: New Website! Welcome to the new Barbershop Harmony Australia website which has launched to coincide with the rebranding of our Association. We are very excited to be able to update the look and feel of our online presence and we hope that you will enjoy using it. We have plenty of items on the to-do list for the site that are yet to be implemented but if you have some feedback about the site, feel free to drop a line to webmaster@barbershop.org.au.